Download our free, HIPAA Risk Assessment. 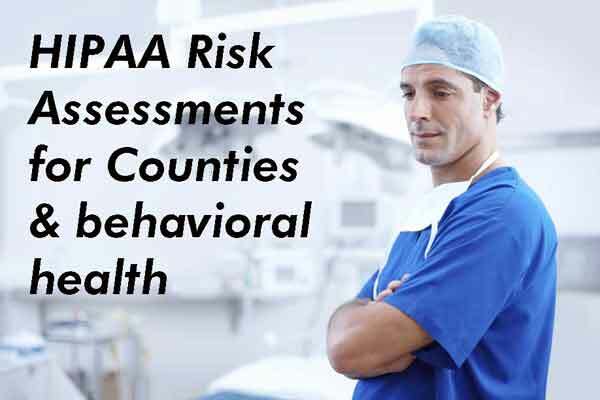 This is a free, functional but scaled down version of our comprehensive risk assessment designed specifically for county governments and behavioral health organizations. Take the challenge and find your security blind spots. Here's the problem. Counties and behavioral health CBOs often think they are compliant with HIPAA regulations for privacy and security but that belief is rarely based on any sort of objective reality such as a formal risk assessment. There are 40 different policies required by the HIPAA Security Rule so an appropriate comprehensive policy document might be 30 - 40 pages long with a corresponding set of procedures. If properly done, these procedure documents require IT staff, corporate compliance, medical records, department management, and many others to perform and document specific activities on a periodic, recurring basis. Moreover, as part of a solid information governance program, your governance/compliance team should include legal, IT, HR, and records management in addition to the inclusion of team members from executive management and your governing board. There are some dead giveaways that reveal a lack of HIPAA compliance. For instance, if you don't have a current risk assessment and risk management plan, you are not compliant. If you've priced out audited risk assessments, you may have discovered they are expensive! I have seen risk assessments for even relatively small counties run between $15,000 and $150,000 on RFP. Do you want to pay that kind of money just to find out you are not compliant? We have been working with HIPAA compliance since 2002 and have developed an unaudited, self-reporting risk assessment workshop you can use to assess your policies, procedures, and risk. This is a two-hour workshop in which we walk you through a set of questions that address every policy component in the HIPAA Security Rule and include several other best practices from ISO/IEC 27001 and the NIST Cybersecurity Framework. Each question is linked to the corresponding policy component required by HIPAA. At the end of the workshop, we'll send you the deliverable -- a color-coded risk assessment report clearly identifying every area in which your policies require additional work so you can begin remediation immediately. We do this as a webinar, so no one has to leave their office. For county governments, we recommend you gather a multidisciplinary team including members from at least three of the following areas. Executive - County Legislator, Commissioner County Executive, COO, CFO, etc. For standalone Community Based Organizations, we recommend a mix of staff members responsible for compliance. We are happy to provide a quote for on-site audited risk assessments if you so desire and we are available to help you develop policies and procedure and review your infrastructure so you can get compliant. Gather your security policies and procedures to use as a reference as we work through the assessment tool. When it comes to information security and HIPAA, you don't need to take anyone's word on what you should be doing. Download the regulations and read them for yourself.